Six years ago California voters were asked to make recreational marijuana legal under state law and they declined to do so. But the close decision — 46% voted “yes” on Proposition 19 — suggested that the battle was not yet over. At that time, The Times opposed Proposition 19 not because legalization was necessarily a bad idea, but because it was a poorly drafted mess that would have created a regulatory nightmare. In the years since, a lot has changed. Four states, starting with Colorado and Washington, have legalized adult recreational use, without major problems. 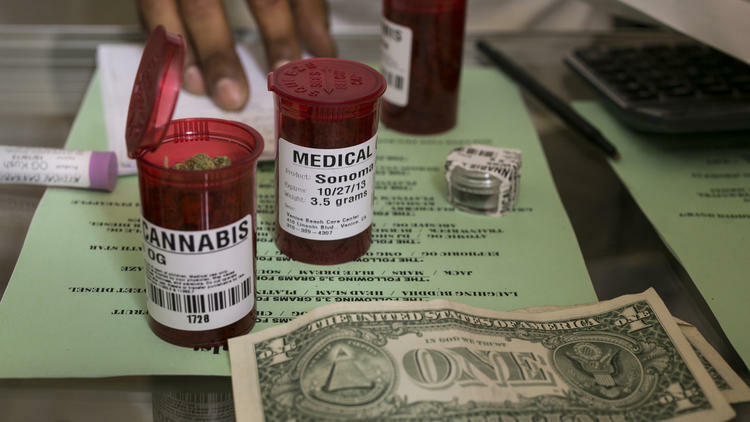 Half of the states now allow medical marijuana. Canada is working on legislation to legalize adult use next year. And Hillary Clinton and Donald Trump have suggested that, if elected, they wouldn’t use the federal prohibition against marijuana to undermine state legalization efforts. There has also been a huge shift in thinking on drug policy, as more people question the effect of the decades-long war on drugs on law enforcement expenditures, overcrowded prisons, marginalized communities and violent drug cartels. In the case of marijuana, there is growing support for the argument that the cost of enforcing prohibition is too great and delivers too few benefits. In November, Californians will again consider whether to legalize pot, this time with Proposition 64, the Adult Use of Marijuana Act. Voters will have to ask themselves whether the time has come to treat marijuana less like heroin and more like alcohol — as a regulated but acceptable product for adult use. Do the risks of legalization outweigh the costs of prohibition? Does Proposition 64 strike the right balance between allowing adult Californians to make their own recreational choices and protecting their health and safety? Does the measure put cannabis-industry profits ahead of public health? What does it mean that marijuana will be legal under California law but still illegal under federal law? On balance, the proposition deserves a “yes” vote. It is ultimately better for public health, for law and order and for society if marijuana is a legal, regulated and controlled product for adults. Proposition 64 — while not perfect — offers a logical, pragmatic approach to legalization that also would give lawmakers and regulators the flexibility to change the law to address the inevitable unintended consequences. The reality is that California has already, essentially, legalized marijuana. Virtually any adult can get a medical marijuana recommendation and buy pot products legally at a dispensary. And those who can’t be bothered to fake a headache or back pain can buy it on the black market without fear of going to jail. Proposition 64 would end the need for such ruses and deal a blow to the illegal market, which thrives on prohibition. If it is passed, adults 21 and older would be allowed to grow, buy and possess marijuana for their personal use in private homes or at businesses licensed for on-site consumption. The state would license and regulate businesses that grow, process, deliver and sell marijuana. Pot shops could not sell tobacco or alcohol. Cities would have the ability to set local regulations and even ban marijuana businesses, but they couldn’t bar adults from growing, using or transporting marijuana for personal use. The measure would impose state taxes on commercial cultivation and sales that could eventually raise more than $1 billion a year. The measure would dedicate the new revenue to youth drug education, prevention and treatment programs, law enforcement programs to reduce driving under the influence, and environmental restoration of land damaged by illegal cannabis cultivation. For decades, drug enforcement — and particularly enforcement of the marijuana laws — has disproportionately affected African American and Latino men, leaving them with criminal records that make it harder to get a job or to advance in their careers. Though California decriminalized marijuana possession in 2010 and misdemeanor arrests have fallen by 90%, there are still people serving time for marijuana crimes or who are hindered by past marijuana convictions. If the initiative passes, individuals could ask to have their sentences reduced, or if they are no longer incarcerated, they could ask the courts to have their criminal records changed. Also, Proposition 64 would take a less punitive approach to youth enforcement: People under 18 caught with marijuana would be sentenced to drug education and community service. Proposition 64 gets a lot right, but the measure still asks voters to make a tremendous leap of faith. The fact is, the health effects of marijuana consumption are still not fully understood, particularly the long-term, regular consumption of today’s high-potency cannabis products. It is known that young people, whose brains are still developing, can suffer long-lasting effects and are at increased risk of addiction and mental disorders from frequent use. That is why it is so important to use a portion of the Proposition 64 revenues to educate teens on the risks of regular, daily use. Public health experts had recommended treating marijuana more like tobacco — a legal product that the state has an interest in discouraging through regulations and high taxes. But because a key goal of Proposition 64 is to foster a legitimate, regulated marijuana industry, some of those experts fear that Big Weed may become the next Big Tobacco, using its profits and lobbying power to minimize research into negative health affects and to stymie regulations that curb consumption. Proposition 64 already offers a lot to the industry; it would not, for instance, strictly limit advertising or bar marijuana industry representatives from serving on advisory committees on cannabis regulations, as public health experts had recommended. Proposition 64 would give the Legislature the ability to amend the marijuana industry regulations by a majority vote; other changes to the law would need a two-thirds vote. Regulatory agencies would be given the flexibility to develop rules as issues arise. That flexibility is welcome if lawmakers and regulators use it to make sure the law meets its objectives — not to grant the wishes of an army of marijuana industry lobbyists. Proposition 64 would not change the fact that marijuana is still illegal under federal law, and that is a serious complicating factor. Growers, sellers and even consumers are at risk if a new administration in Washington suddenly decides to enforce federal law. Is that likely to happen? Four states have already legalized recreational use and five more, including California, are voting on legalization in November, and 25 states allow medical marijuana. By choosing not to stop the states, President Obama and Congress have essentially permitted more liberal marijuana laws. At the same time, however, they have been unwilling to amend federal law to make clear what is and isn’t allowed. In fact, the Drug Enforcement Agency decided last month to maintain marijuana’s status as a Schedule 1 drug, meaning it is as addictive as heroin and has no medical value, despite the fact that half the states in the nation permit medicinal use. By sending mixed messages, the federal government has effectively ceded its role and left it to states to create a new national marijuana policy that legalizes marijuana with minimal harm and meaningful protections. Proposition 64 is California’s attempt to do just that. The Times urges a “yes” vote.